I was born and raised in Akron, Ohio where my early visual interest in suburban house types and studying floor plans and rooms in 1960s design magazines began a passion for historic architecture. Catering doll teas from my aqua Easy Bake oven, messing up my mother’s pink-applianced 1950s kitchen for my Girl Scout “Cooking” badge, and hours spent in my own pink play kitchen under the basement stairs would also instill a love of pantries and food. In 1974 I moved to my grandparents’ New Hampshire farm with my mother and two brothers after memorable summer visits as a child. In these more northern and hearty climes, fans were usually replaced by fresh pine air and stoked wood stoves in winter. On the farm I continued to cook, draw floor plans, and learned to tend a garden. I learned to embrace the darkness at night, instead of a well-lit suburban street, and to star-gaze as my father had shared with me, as well as his love of music. From my grandmother, and others, I developed a love of books and reading, for research, and for writing. I received my B.A. in art history from Wheaton College (Norton, MA) and spent my junior year studying art and architecture at University College London. After working for the National Trust for Historic Preservation’s Yankee Magazine Intern Program (I had also been an intern), I moved into Gibson House Museum, a preserved Victorian-era townhouse in the Back Bay, where I lived and worked as a resident guide. Later I would complete a history and study report of the site that helped define its eventual Boston Landmark and National Landmark status. While in graduate school I worked as a “Project Prepare” intern, and wrote planning and historic preservation studies of two New Hampshire towns, Jaffrey and Harrisville, for the National Trust for Historic Preservation. I received my M.A. in historic preservation studies from Boston University. I have worked as a preservation consultant and in public relations at Antioch New England Graduate School where I wrote press releases, ad and catalogue copy, and edited and wrote for their alumni newsletter. I was also site manager for Historic New England's Barrett House, a rural New Hampshire historic museum house built in 1800. There I planned diverse programs, generated press and articles in local and national magazines and operated a weekend tearoom that was featured in the original Victoria Magazine. I have contributed a variety of house-related and personal essays to design magazines such as Victoria, Old-House Interiors, and Early Homes, among others, and have contributed to many regional and local publications. 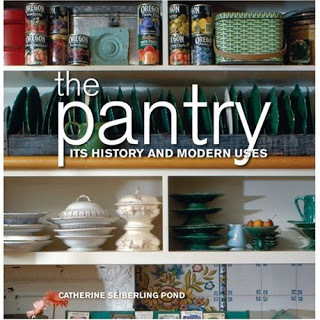 My first book The Pantry—Its History and Modern Uses was published in May 2007 by Gibbs Smith, Publisher and combined my life-long interest in pantries as well as the domestic and design history of kitchen spaces. You can read more about pantries and earlier domestic musings (2005-2010) at my blog In the Pantry. For over a decade I lived with my husband Temple Pond and our three children in his ancestral 1813 Federal home in a classic New England village. Here we built two traditional-style butler's pantries and collected too many things. Since 2008 we have lived on a Kentucky ridge farm where we raise pastured cattle, chickens, cats, a bull mastiff named Roscoe, a bull named Edgar–and two hard-working teenage boys (well, almost 18 and 21 now). You can read more about our farm on my blog Farmwife At Midlife. I continue to work as a professional freelance writer, have some new book plans in the works, and regularly contribute farm and country-related articles to the online magazine, Rethink:Rural.